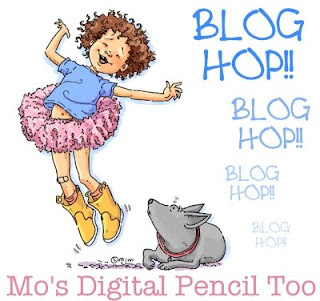 Welcome to this months Blog Hop from the Gang at Mo's Digital Pencil. I thought this card might make a gift for a gardener as behind the Rustic Window are an assortment of flower seeds. So when the recipient has finished with the card, they can take it apart & grow their own window box of blooms. Now...it's imperative that you join in our hop this month as I'm sure the rest of my teamies will have some fab inspiration that could just resolve all your Christmas gift ideas. You should have arrived here from Kerttu's lovely blog and after me it's our Julie. There's 2 spot prizes of $5 up for grabs for 2 lucky peeps who leave some 'lurv' along the hop to spend at Mo's Digital Pencil. What a great idea to give someone flower seeds. Thay than can think about the next spring! Oh Jane, absolutely stunning card! Love the beautifully colored image, gorgeous! Nice gift idea too. This is adorable Jane and a fab gift idea.. This is so sweet Jane, love it. Clever way to give a gift of flowers...well done design! Great card and really great idea with the flower seeds. Thanks for sharing. Ilove it! I love the colors and always love window frames on cards or other projects...Would love having seeds as a gift. TFS! That's a great idea for a gift, Jane. I am thinking local wildflowers, in California, November - January are perfect times for sowing the seeds. Very creative - great gift! I have always loved this image and your saying is one of my favorites! Wishing you a happy day! Gorgeous card Jane, love the gift and the image together. Beautiful card! Perfect idea for a gardener! Love that sentiment, too! Great idea, I love that you can see through the window too! What a fab idea, love it. What an amazing idea - never seen this before - stunning card. Love your card idea and the flowers are so pretty! great job! What a great card - love the DP. Such a clever idea - and perfect for any gardener - LOVE it! Great hop for Mo's images lovers! ;) Love your card! !